November 5, 2018 – Our time machine soars over the Great War’s trenches — and gets down and dirty on ground level — through the eyes of a pilot in the very early days of U.S. air power. Our guide on this journey is Patrick Gregory, co-author of An American on the Western Front: The First World War Letters of Arthur Clifford Kimber 1917-18 . Written along with his mother-in-law, Elizabeth Nurser (Kimber’s niece), Patrick Gregory has produced a true labor of love, bringing to life the only Great War record of its scope from the period of America’s involvement. In addition to having a family friend in former President Theodore Roosevelt, Lt. Kimber also had the distinction of carrying the first official U.S. flag to the nation’s European allies, adding rich details to the story of one doughboy among so many. Patrick spent most of his career as a journalist at the BBC, working for 20 years at Westminster and helmed a number of political and history documentaries, as well as working in journalistic democracy-strengthening initiatives in the Asia-Pacific area. 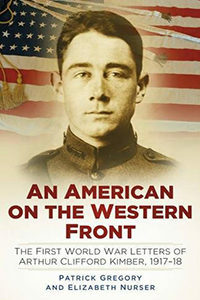 Visit him online at AmericanOnTheWesternFront.com or @AmericanOnTheWF on Twitter.